The Enuma elish (“When in the heights”), was the most hallowed, religious-political-scientific text of Babylon, the direct cultural descendant of ancient Sumer. The Sumerian Epic was read as a central part of the New Year rituals, often portrayed in the Babylonian equivalent of a Passion Play. Texts found in the library of the Assyrian king, Ashurbanipal, in Nineveh (a city of biblical renown) recorded a tale of creation that matches, in some parts word for word, the tale of Genesis. And yet the Sumerian version was written well over a thousand years before Genesis was cast in its present framework. In The Seven Tablets of Creation (the Enuma elish, by yet another name), the 7th tablet is entirely devoted to the exaltation of “the Lord” -- Marduk, Ashur (Assyrian), or what-have-you. The tablets, in effect, devoted six pages to the handiwork of the Lord, and the seventh to a day of rest, when everyone could glorify the Lord. Sound familiar? The Sumerian Epic of Creation, thoroughly beat to death in our last episode, has the wonderful quality of being colorful, poetic, detailed, and internally self-consistent. The question that might arise, however, at least from those more inquiring minds (those who read the National Enquirer, for example), is whether or not the description is externally consistent, i.e. does it agree with other sources -- sources ranging from the Bible to the observations of modern day science. The biblical tale of Genesis was originally written down for the first time circa 600 B.C.E while the Hebrews were being held captive in Babylon, but with access to early Sumerian texts. The resulting first chapter of the Bible is considered by many scholars as an extremely brief, executive summary of the Sumerian texts. “And God made the firmament, and divided the waters which were under the firmament from the waters which were above the firmament; and it was so. Clearly, the firmament which divides the waters of the inner and outer planets would constitute the asteroid belt. A skeptic, however, might wonder what is meant by the “waters”. Obviously, Earth qualifies as a watery planet, but do the other planets? Interestingly enough, “the waters which were above the firmament” have been found on the moons of Jupiter and Saturn (many of these moons are predominantly water), while Neptune and Uranus have been determined (primarily from the data from the Voyager 2 spacecraft’s close encounter with the outermost giants) to be mostly water themselves. Here the biblical and Sumerian versions dovetail beautifully. The Epic of Creation explains why Earth’s continents were so concentrated on one side of the planet, with the oceanic basin of the Pacific ocean on the other side. When the Earth was cleaved from Tiamat, the Earth wasn’t a perfectly spherical object, but something of a lopsided ball with a major chunk torn out of one side. Tiamat, the “watery monster” also obviously bestowed upon the Earth much of her waters (not to mention the comets which are almost always found to be composed of primarily water-ice). These waters would then gather in the Pacific depression, while the lands “gathered together” on the other side. Modern science has confirmed this initial state of affairs of the Earth, and has even suggested that the continents regularly “gather together” in a roughly 450 million year cycle [Scientific American Apr 1992 and Jan 1995]. The last continental class reunion occurred some 300 million years ago, and the party lasted until the single landmass broke up roughly 180 million years ago. The last party began with Laurentia (North America), after floating about the Iapetus Ocean for a hundred million years or so, colliding with Baltica (Europe and Asia) to form Laurasia. Things really got cooking when the Iapetus vanished and Laurasia fused with Gondwana (all the other continents) to create Pangaea. 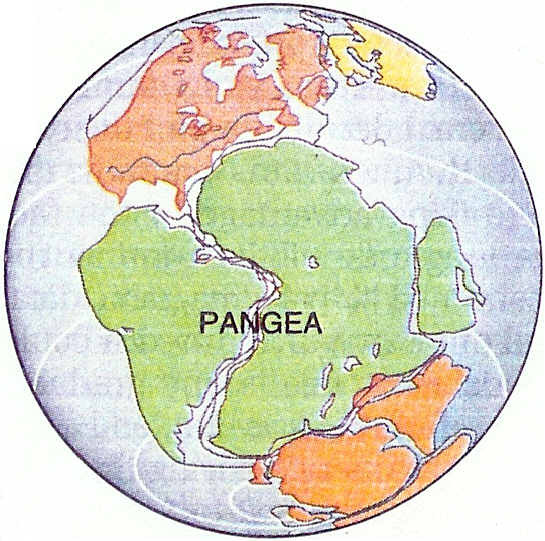 For those inclined to become more erudite, Pangaea means “all lands”, a term first proposed by Alfred L. Wegener, who proposed the theory of continental drift in 1912. Gondwana, on the other hand, derives from when Alfred first proposed his theory. Many of his colleagues responded to his idea of this land with incredulity, saying, “Ah, go on!” Part of their amazement derived from the fact South America fit so neatly into an embracing Africa, while Antarctica and Australia formed a crescent from the combined tips of South America and Africa, and India was attached to the lower portion of the Arabian peninsula, on the opposite side of Africa from South America. More on this a bit later. It is probably worth mentioning that when Wegener first proposed his theory, he was quite literally laughed off the stage. Then, about 25 years ago, modern science caught up with reality and devised the theory of plate tectonics. In effect, modern science has only just recently caught up with the understanding of the history of our planet that was already extant in biblical and Sumerian sources. Even more recently, with the launching of Voyager 2 on a grand tour of the outer planets (Jupiter, Saturn, Uranus and Neptune), modern science has discovered what the Sumerians knew some 5,000 years ago. More importantly, previous scientific theoretical descriptions of the nature of these outer four planets were not even close to the reality discovered during the 1980s by the Voyager 2 spacecraft -- a reality, incidentally which does correlate exceptionally well with the ancient Sumerian texts. Consider, for example, the 1986 Voyager 2 encounter with the planet Uranus, described in great detail in the peer reviewed and highly respected journal, Science [July 4, 1986]. Pictures from Voyager 2 revealed Uranus with a greenish blue color, and a planet covered not by frozen gases (as had been previously theorized by modern science), but by water -- a virtual ocean of water! And while a gaseous atmosphere enshrouds the planet, below it was found a 6,000 miles thick layer of, incredible as it might seem, “superheated water, its temperature as high as 8,000 oF” [quoted from analysts at the Jet Propulsion Lab (JPL)]. Uranus also lies on its side, as though it was hit by another large celestial object in a collision [guess who]. Its winds blow in a retrograde direction, contrary to what is normal in the Solar System (and contrary to what was expected by experts in the field prior to Voyager 2). Because of Uranus’ ocean of superheated water, its temperature on the side that is hidden from the Sun (perpetually!) is the same as on the side facing the Sun. This is not as surprising in that being so far from the Sun, the “geothermal” (Urathermal?) energy of the planet could have been expected to far exceed the energy from solar radiation. Meanwhile, Uranus’ magnetic field has an unusually extreme inclination (58û) relative to the planet’s axis of rotation. Its day is only 17 hours long. Another ten moons: “All these objects probably were derived from fragmentation of a precursor about 3.5 billion years ago; most probably were disrupted and reaccreted in the last one to two billion years.” In addition to all of this, Miranda has an elevated, flattened-out plateau delineated by a 100-mile long escarpment that at one point forms a right angle (i.e. a “Chevron”). This moon is “one of the most enigmatic objects in the solar system” [NASA]. Prior to Voyager 2, modern science had no hint, had not even conjectured a massive celestial collision involving Uranus. And yet, every detail confirms the Sumerian version. But what about Uranus’ “twin”, Neptune? Science had to wait another three years for this confirmation. It was in early 1987 that Voyager 2 photos of Neptune revealed a blue-green, aquamarine planet embraced by an atmosphere of helium, hydrogen, and methane gases; all swept by swirling, high-velocity winds. Neptune emits heat (emanating from within the planet), has a rocky core and according to JPL scientists, “a slurry mixture of water ice”, revolves in a 16 hour day, and has a sizable magnetic field oriented at a surprisingly extreme inclination of about 50û. In ancient Sumerian texts, Uranus was called Kakkab shanamma, “Planet which is the double” of Neptune. Science now knows the two planets are look-alikes in size, color, and watery content. Both are encircled by rings and a multitude of satellites or moons. Both have their magnetic fields at an extreme inclination, have similar days (16 to 17 hours), and even have the same temperature, despite the fact Neptune is much further from the Sun -- JPL reports state that “Neptune’s temperatures are similar to those of Uranus, which is more than a billion miles closer to the Sun.” Neptune somehow is generating more of its internal heat than Uranus does” -- somehow compensating for its greater distance from the Sun to attain the same temperatures as Uranus generates, resulting in similar temperatures for both planets -- and thus adding one more feature “to the size and other characteristics that make Uranus a near twin of Neptune [emphasis added].” Mark up another one for the Sumerians! Neptune’s primary moon, Triton, besides having the unique characteristic of a retrograde motion, turns out to be a bluish colored moon, almost the size of the Earth’s Moon. Beneath a thin atmosphere the surface is pinkish gray with rugged, mountainous features on one side and smooth, almost crater-less features on the other side. This similarity of the Earth’s continental land masses on one side and oceans on the other, makes one think of Triton being derived as a split-off chunk of a larger body (just as the Sumerians described in the creation of both Triton and the Earth). Before Voyager 2, Neptune was known to have only two satellites: Triton and Nereid. In the fly by, Nereid was found to have a very peculiar orbit: unusually tilted compared with Neptune’s equatorial plane (as much as 28o), and very eccentric -- orbiting the planet at a distance as close as one million miles and as far as six million miles from Neptune. Furthermore, Nereid, although of a size that by planetary-formation rules (those postulated by modern science, sic!) should be spherical, has the shape of a twisted donut (but one without the customary covering of powered sugar or chocolate). It is also bright on one side and pitch-black on the other. According to the peer-reviewed journal, Nature [June 2, 1989], “Nereid accreted into a moon around Neptune or another planet and that both it and Triton were knocked into their peculiar orbits by some large body or planet.” “Imagine that at one time Neptune had an ordinary satellite system like that of Jupiter or Saturn; then some massive body comes into the system and perturbs things a lot.” [emphasis added] The evidence suggests that dark matter belonging to an impacting body “went splat on one side of Nereid.” The six new satellites of Neptune found by Voyager 2 “are very dark” and “all have irregular shapes”, even though at least one, designated 1989N1, is sufficiently large to be expected to have a spherical shape. In the case of Jupiter and Saturn, their moons and rings are now known (to modern science) to be made, if not wholly, then in large part, of water-ice, and perhaps even liquid water. Saturn’s moons of Janus, Mimas, Enceladus, Tethys, Dione, and Rhea appeared to be “icy bodies... consisting largely of ice.” Titan (larger than the planet, Mercury) may be as much as 85% water (the rest, rock), a portion of which includes a layer more than 100 miles thick of bubbling hot water! Iapetus (namesake of Earth’s primeval ocean) is “coated with water ice” in its bright areas. Jupiter’s moon, Europa, has a latticework surface of vein-like lines suggestive of shallow fissures in a sea of frozen ice. There is also a layer of mushy water ice under the cracked surface, which could include warmer oases of liquid water capable of sustaining living organisms. In fact, according to some scientists, Europa’s ice covering of several miles thickness may overlay “an ocean of liquid water up to thirty miles in depth, kept from freezing by radioactive decay and the friction of tidal forces.” Ganymede, Jupiter’s largest moon, is probably almost entirely water ice. Jupiter’s other large moon, Calisto, appears to be 50% water. Only Io appears waterless (its waters boiled off?). Another critical factor is that life may be much more prevalent in the universe by virtue of being associated with the waters of the inevitable giant planets of this and other star systems. Water is not only a really big deal for humans, but water may be the primary environment for life in the universe. Most extraterrestrial intelligent races may have never left the oceans and exist instead in watery domains -- with little or no interest in moving onto the lands (if there was any land to be had). This would also imply that the whales and porpoise of Earth may have a lot of friends or species-like brethren out there (as per one of those Star Trek movies). The latter might also explain an aspect of Douglas Adams' book, So Long and Thanks for All the Fish (with the porpoise and dolphins leaving Earth just prior to its destruction). El is the Hebrew equivalent of Ilu (translated “god” but literally meaning “the lofty one”). It later becomes Elohim, a Creator who is plural (literally, “the Gods”). And yet these "gods" are One. Genesis goes on to explain that Elohim called the Raki’a (Hebrew for Firmament, or literally, “Hammered-out Bracelet”), Shama’im, “the Heaven”. In its first use in the Bible, the name consists of two words, sham and ma’im, meaning literally, “where the waters are.” In the creation tale of Genesis, as well as the Sumerian Epic of Creation, “the Heaven” was the specific celestial location where Tiamat and her waters had been, where the asteroid belt had been hammered-out—the same asteroid belt of which modern astronomers were blissfully unaware until the middle of the 19th century. But now we know better, don’t we! Even when we only have access, in some cases, to a watered-down version! (Sorry. I couldn’t resist the temptation!) One might also obliquely note that the Sumerian texts were not translated in large part until the middle of the Twentieth Century. Meanwhile, back at the ranch and substantially closer to home, we might make note of several other factors. From the space program’s landings, we now know that the crusts of the Moon and Mars comprise 10% of their total mass. But the Earth’s crust comprises less than 1% of the Earth’s landmass. One modern day theory suggests that crustal material of the Earth has sunk down to a depth of some 250 miles. This would increase the thickness of the Earth’s crust tenfold, but only to the point of the crust then comprising about 4% of the Earth’s landmass. (There is also the problem of the mechanism that sinks the crustal material down in the first place!) And if that doesn’t confuse the issue sufficiently there is also the issue of the continental part of the crust being lighter (less dense), thicker by a factor of anywhere from 3 to 9 times, and much older. The latter may be due to the effect of erosion converting continental crust into oceanic crust, but the Earth, when compared to the Moon and Mars, is still missing a great deal of crust. It makes one wonder if perhaps the Earth’s origin is distinctly different from the other planetary bodies of the solar system. Perhaps the Sumerian version of the Earth’s unique creation is scientifically and historically valid! In the 18th century, Pierre-Simon de Laplace put forth the Theory of Coaccretion, a common birth whereby the solar system was born of a nebular gas cloud that coalesced in time to form the Sun and the planets. Unfortunately, the Earth’s creation didn’t quite fit this theory. Scientists then came up with three competing alternatives. The first is the Fission Theory, or the “thrown-off chunk” idea, where the Earth and Moon split (with Mother Earth taking the bulk of assets in the property settlement), or where the Earth just throws off a chunk of unwanted material -- a primeval, classic example of throwing out the garbage (but alas, the garbage never really going away). A second theory is the Capture Theory, whereby the moon wanders by too close to the Earth and like a careless fly near a spider trap, ends up orbiting the Earth. Finally, there is the “Big Whack Theory” or for the more serious among us, the Collision-Ejection Theory. The splitting up theory suffers from the problems of most divorce theories, but also has a few peculiarities of its own. Most are problems of dynamics: the Earth-Moon system would need four times as much angular momentum as it currently has. Furthermore, no scientist seriously considers the possibility of any “leakage” of the excess angular momentum over the billion years since, inasmuch as the conservation of angular momentum is slightly more sacrosanct than that of the conservation of energy. There’s also no accounting for where the excess angular momentum might have come from in the first place. Finally, there’s the minor problem of the Moon having too much of the “siderophile” elements (tungsten, phosphorus, cobalt, molybdenum, and nickel) and too little of the “refractory” elements (aluminum, calcium, titanium, uranium... and a few other ium’s). In other words, the compositions of the two bodies is dissimilar. The Capture Theory also has problems with the laws of angular momentum -- the essential problem being that the Moon is too big for the Earth. If the Moon came from deep space, its speed upon reaching Earth (as reflected in its angular momentum) would have been too much for Earth to overcome. In fact, the Moon’s excessive size (in comparison to Earth) is a fundamental problem to modern cosmologists. On the one hand, Earth is the only “terrestrial planet” to have a moon. Mercury and Venus have none, and Mars has only two captured asteroids. On the other hand, the big four of the outer planets (Jupiter, Saturn, Uranus and Neptune) have relatively small moons. The ratios of the sum of the masses of all the moons of each planet to the mass of its parent planet are 0.00021 (Jupiter), 0.00025 (Saturn), 0.00017 (Uranus) and 0.00130 (Neptune). The Moon/Earth ratio is 0.01220 -- over 9 times that of Triton, et al to Neptune and roughly 50 times for the other three planetary systems. In fact, a good question arising from all this is: Why does the Earth even have a Moon at all -- Other than, that is, for romantic evenings, crazed lunatics during full moons, menstrual period timing for the ladies, and other delights? The Collision-Ejection Theory suffers from the problem of relative elemental compositions if the intruder came from further out in the solar system, and/or insufficient momentum to do the job if coming from the terrestrial planet neighborhood. Furthermore, the Moon shows all the signs of a “relatively cool origin”, whereupon some 500 million years after its initial creation (according to NASA) “celestial bodies the size of large cities and small countries came crashing into the Moon and formed its huge basins and towering mountains.” This correlates well with the fact that “the age of many samples of lunar rocks cuts off rather sharply at four billion years; few older rocks have survived.” The [pulverized] soil on the other hand goes back to 4.6 billion years. Then there’s the question of whether or not the Moon was originally a planet, as the Sumerians described it in their Epic of Creation. In the 1970s and 1980s (C.E. ), the Moon was found to possess virtually all the attributes of a planet with the exception of an independent orbit around the Sun. It once possessed a magnetic field (caused by the rotation of a molten iron core), but its magnetism “dwindled away circa four billion years ago” -- the time of the Celestial Battle! (Actually, “dwindled” might not be the best word. “Crunched” might be more appropriate. Or even: “it was relieved of its Tablet of Destinies”.) In addition, lunar volcanism leads to the conclusion that the Moon once had a full-fledged atmosphere whose volatile elements and compounds included hydrogen, helium, argon, sulfur, carbon compounds, and water. (Some scientists theorize that there may be as much as 100 billion tons of water in the form of ice at the Lunar poles.). Of course, the Sumerians noted the origin of the Moon (KINGU) at the side of the watery Tiamat. But their Celestial Battle also resulted in a shrinkage of KINGU. “And Kingu, who had become chief among them, he made shrink, as a DUG.GA.E god he counted him.” Modern science has noted that Mercury and Moon are the products of unusual circumstances, and that the Moon has a low mean density and is greatly depleted in iron (implying a shrinkage). Furthermore, gravitational variations inside the Moon reveal the existence of compacted, heavier masses in several concentrations, especially where the surface had been flattened out. The core, in fact, appears to have the shape of a gourd, as if it bears the mark of a “big whack”. DUG.GA.E literally means “pot of lead”. One of the Apollo discoveries is the excess lead in the Moon’s crust. Finally, on the side facing away from the Earth -- its far side -- the surface has highlands and a thick crust. The near side (the side facing Earth), on the other hand, shows large, flat plains, as though the elevated features had been wiped off... Like in a collision, or a glancing blow. Or just a big whack upside the head! The accumulation of facts by modern science, particularly in the last several decades, actually corresponds quite well with the Sumerian version of the creation of our solar system. In addition, in developing scientific theories of the creation of the solar system, faster computer simulations allow purveyors of celestial mechanics to discover chaos “turning up everywhere”. For example, “many orbits that lie between Uranus and Neptune become chaotic,” and that “the orbital behavior of Pluto is chaotic and unpredictable.” Many such computer simulations found original chaos throughout the Solar System, “but especially among the inner planets, including Earth.” One scientist described the terrestrial planet zone as the accretion of “lots of brothers and sisters” that collided to form “trial planets”. The process of accretion -- crashing into one another, breaking up, and capturing the material of others, until some grew larger and eventually became the terrestrial planets -- he said, was noting short of a “battle royal” that lasted most of the first 100 million years of the Solar System. [Science, May 17, 1985] These words echo the Sumerian version almost to the exact phrasing. Uranus + Neptune = Pluto (within a 0.22% error). Such mathematical correlations imply that there is a physical connection between the orbital cyclical periods of the planets. It’s the sort of thing that makes one wonder about the validity of such things as astrology. It’s all very curious, and all very complementary between theories, religious teachings, and ancient historical texts. Everything falls into place, once the basics are understood. Then there are some of the intriguing details of Nibiru. Attached to this episode of the Annals, is an Interlude, a brief but filled with grotesquely mathematical calculations relating to the orbital dynamics of the Avenging Planet. For the non-mathematician, some results might be of interest. For example, the orbital period is assumed to be 3,600 years, implying an aphelion (furthermost point from the Sun) of some 457 Astronomical Units (where 1 A.U. is the distance from the Sun to the Earth). Because of the extremely elliptical orbit of Nibiru, it is only within the confines of the solar system (within 50 A.U. of the Sun) for only about 60 years. We noted above that there is the suggestion by one scientist that the condition of the Uranus system might be due to a collision with “an object the size of the Earth traveling at 40,000 mph”. This digression in the Annals of Earth to describe the current scientific understanding of the solar system was done in order to demonstrate the amazing validity and accurate description of the solar system, its cosmogony, and its current status, as reflected in the Sumerian texts, specifically its Epic Of Creation. It’s important to recognize that the Sumerians were telling it like it is! This is not mythology, nor a fantasy of a five thousand year old civilization. It’s an accurate rendering. It’s also important to note that the biblical version correlates well with the Sumerian version. In fact, most biblical scholars believe that the book of Genesis, in large part, is a brief executive summary of the Sumerian texts; the biblical version having been slightly edited in some very specific ways from the original Sumerian. The validity of this latter statement is supported in part by what has been discussed above in these Annals, and will receive further support in the coming episodes. One might also note that the Bible is widely believed and given great credence by many people (and without a great deal of skepticism). Inasmuch as the Sumerian version is the original and the basis of the biblical Genesis, one might ask whether or not it is reasonable to expect an equally willing acceptance of the Sumerian texts. Just a idea, mind you, but one whose time may very well have arrived. And so we leave you now, returning from the years of yesterday, to those of today. Well, maybe a bit more recent. If the Sumerian version of the cosmogony of the solar system is so accurate, then doesn’t it make sense that Nibiru really exists? If the assumption of an orbital period of 3,600 years for the planet Nibiru is wrong, do we need to be concerned about an early return? For example, do we need to worry about the god Marduk returning and reasserting his claim as the Lord and creator of all he surveys? How did Earth create life on its surface, when it obviously had a major league, splitting headache after Nibiru’s most recent visit? With all the water available, is there life on Mars? Do we have enough ado available to continue without further ado?